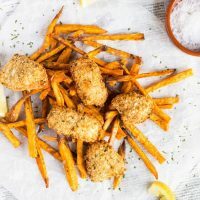 Oven Baked Fish Nuggets, made with real fish, are the homemade alternative to boxes of crumbed fish from the supermarket. Make extra, and keep some nuggets in the freezer for a speedy dinner. Loved by the whole family. In this step you are setting up an assembly line, so that the fish can be quickly transferred through each coating step. At the end of this stage, you should have four separate 'stations': the seasoned flour on a sheet of baking paper, the eggy milk in a bowl, the seasoned breadcrumbs in a tray, and finally a tray to place your coated fish on. Place the flour, sumac, and salt & pepper together in a separate bowl and stir together. Pour this seasoned flour onto a sheet of baking paper. Whisk the eggs and milk together in a shallow bowl. I use a shallow pasta bowl for this. Mix the breadcrumbs, parsley, lemon zest and salt & pepper together in a medium bowl. Drizzle the olive oil over the seasoned breadcrumbs and stir thoroughly to ensure everything is well coated in oil. Pour half of the seasoned breadcrumbs into a shallow tray, and set the remainder aside. Cut the fish into 5- 7cm sized pieces. Depending on the size of the fillets, some pieces will be irregular in size and shape. Take a piece of fish and coat it in the seasoned flour. Dip the floured fish into the eggy milk, allowing any excess to drip off. Roll the fish in the seasoned breadcrumbs and place on the tray. Repeat with the remainder of the fish pieces, replenishing the breadcrumbs in the tray from the reserved crumbs in the bowl as required. The fish nuggets can be baked immediately, however if time permits allow them to sit in the fridge for 30 minutes. This allows the coating to set. The fish nuggets can be frozen at this stage. Preheat the oven to 200C (180C). Place an oven rack on an oven tray. Space the nuggets out on the tray, ensuring they don't touch. Bake in the oven for 12 - 15 minutes*. Exact timings will depend on the thickness of the fish and the effectiveness of your oven. If you are unsure as to whether they are ready, cut one open to check. You can turn the nuggets halfway through the cooking time, although I tend to forget and the nuggets still brown up nicely. *Add an extra 5 minutes to the cooking time if baking frozen nuggets.